An even function is one that is symmetric about the y axis. Such functions have the property that f(x) = f(-x). An odd function is one that is symmetric with respect to rotation by 180 degrees around the origin. Odd functions have the property that f(x) = - f(-x). 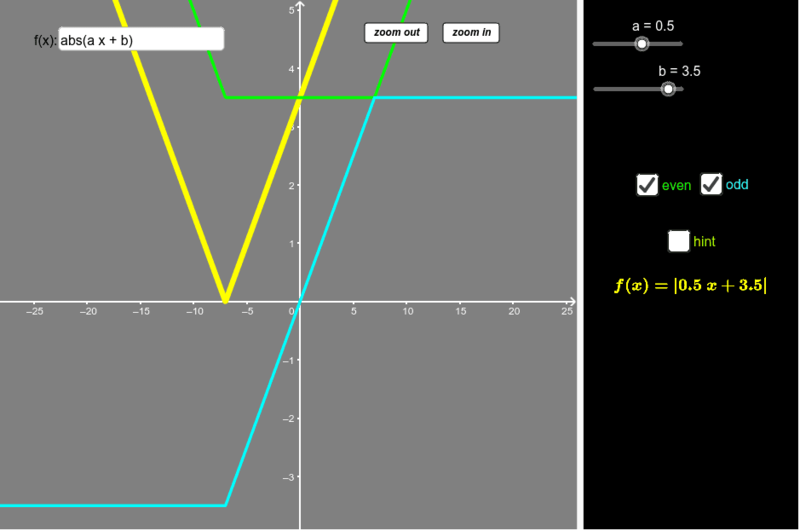 In this applet you can explore this behavior for a function of one variable f(x) that depends on two parameters a and b. Your function can be written as f(x) = fe(x) + fo(x). The applet will display the even and odd functions that can be combined to make your function. Challenge – Given a function, how can you determine the even and odd functions that combine to make that function? Is this combination unique? How do you know? What problems could/would you set for your students based on this applet?